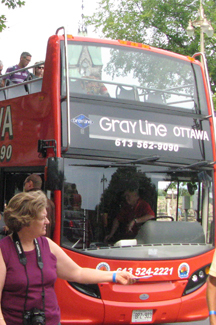 Ottawa Grayline specializes in guided tours of the National Capital region of Ottawa-Gatineau on our open-top double decker buses. These unique multilingual guided tours of Canada's capital let you appreciate Ottawa's historic scenery from every possible angle. Thrill to the stunning sites on land and explore at our own pace. Our tours are narrated from start to finish and are available in 8 languages: French, English, Portuguese, Spanish, German, Mandarin, Japanese or Russian.